It is the Armenian punch cutters and type founders of the Ottoman Empire who predominantly contributed to the development of Ottoman typography. Of all these Armenian punch cutters and type founders, Ohannes Mühendisyan stands out for the sharp and clear typefaces he produced, a body of work which later earned him renown as the “Eastern Gutenberg”. 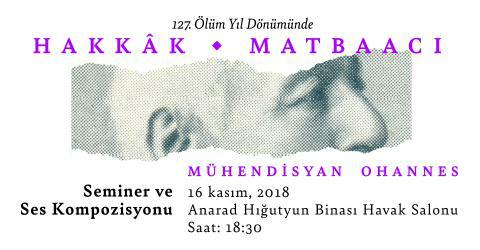 This upcoming November marks the 127th anniversary of his death, and I, alongside Candaş Şişman, wanted to commemorate this date for the first time by organizing a lecture and a sound composition event. The program will be comprised of a few events. Onur Yazıcıgil will give a 30-minute presentation on Mühendisyan’s significant contributions, not only to Ottoman typography but also to International Arabic typography. His lecture will be followed by the motion and visual artist Candaş Şişman’s graphic notation and sound composition based on the forms of Mühendisyan’s typeface. The evening will end with a reception, where some wine will be served. The event will take place on Friday the 16th of November at 18:30 at the Anarad Hığutyun Building’s Havak Hall. The event is open to public and the seminar will be delivered in Turkish.